A work of art rendered in rich cherry wood, this incredible custom kitchen features exquisite cabinetry that resembles artisan built furniture. A gourmet chef�s dream, this luxurious package includes granite counter tops, premium stainless appliances and a large pantry. With enough storage for extra provisions, and the holiday tableware, you can cook and entertain in comfort. Awake to ocean views in the spacious master bedroom where skylights allow star gazing from your pillow. Complete with French doors, private deck, walk-in closet and deluxe en-suite with jacuzzi tub and separate shower. An ideal setting for memorable meals, the magnificent dining area features a vaulted ceiling and soaring wall of glass. Expansive windows throughout the home afford diverse and dramatic views while bathing the interiors in an abundance of natural light. Perfectly suited to its rustic surroundings, the neutral palette and clean lines of this West Coast contemporary design are timeless in their appeal. Offering 3,800 sq.ft. on two levels, this fine home features an open concept floor plan, quality finishes, hardwood floors, superior bathrooms, beautiful patios and a balcony that runs the entire length of the house. Designed with convenience in mind, all five bedrooms have private access to decking. Exterior touches include, extensive concrete pathways, in-ground sprinkler system, water fountain, landscape lighting and more. The result of masterful landscaping and a moderate climate, the inviting oasis of the extensive grounds affords a sophisticated outdoor lifestyle. Picnic in the charming gazebo with fabulous marina views, or dine alfresco on the lovely BBQ terrace. Stay home and enjoy the premium leisure activities available just outside your doorstep, or venture further afield and explore the world class recreation Vancouver Island is famous for. 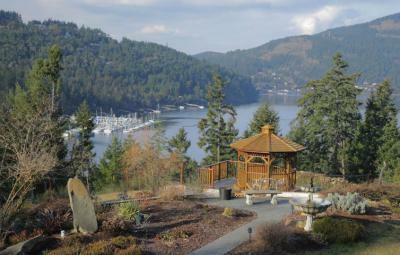 Renew your body and relax your mind, the peaceful shores of magical Maple Bay await you.